You’re a Certified ScrumMaster® (CSM®) , who’s been introduced to Scrum values, practices, and applications. The next step in your Agile journey is to achieve your Advanced Certified ScrumMaster (A-CSM℠) certification. Facilitate better dialogue between the Product Owner, Team members, customers, stakeholders, and executives. Increase engagement to encourage greater accountability, commitment, and buy-in. Successfully complete all educator-designed components of an approved educational offering. This may include pre or post course work as deemed necessary by your approved educator to complete the learning objectives. Validate at least one year of work experience specific to the role of ScrumMaster (within the past five years). 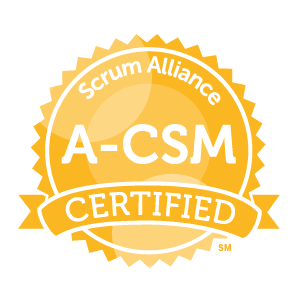 NOTE: You may take the A-CSM course at any time after completing your CSM certification, but must have at least 12 months of Scrum Master experience logged into your Scrum Alliance profile before you can receive your A-CSM certification. Ready to advance your career as an Advanced Certified ScrumMaster? Find an offering here. If you have additional questions, please visit our FAQ page or contact support@scrumalliance.org.